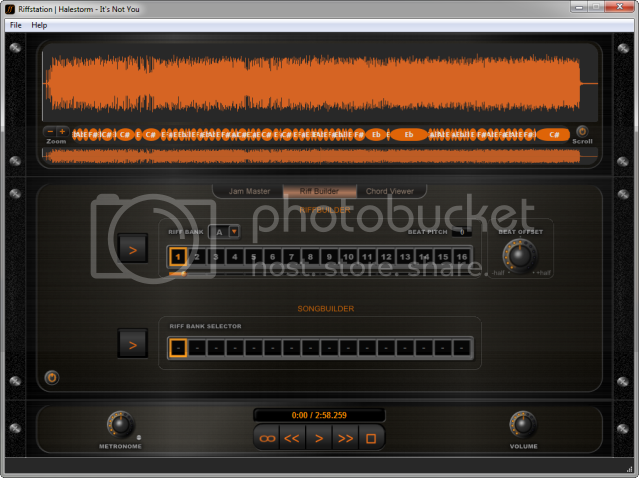 Riffstation is a stand alone software package for breaking down songs, working on them, rebuilding them (via loops). For my uses, it is essentially a tool to learn songs and parts within those songs. You can slow down, re-pitch, and isolate guitar parts to better hear them and learn them. It consists of three main modules in order to do so. The first is the “Jam Master” window. This is the default. You get the song in visual waveform at the top, the chords underneath on the top window. The middle section of the window is the Tempo, “Isolate” window and Pitch. You have transport controls, a metronome and volume. Once you open the audio file, it processes a waveform and - remarkably - a chord progression guide that is fairly basic, but surprisingly accurate. It grabs the fundamental note of the chord and was often pretty accurate at least to start from. You can use the metronome and change its volume in relation to the track. It’s quarter notes only, but it’s always accurate. Slowing songs down is similar to other programs I’ve used, it retains pitch when you slow the song down. You can then manually adjust the pitch once you do slow it down (or speed it up) but you adjust it by semi-tone and then you still also have very ‘finetune’ control over pitch beyond that. It does work very well. With the Width, Separation and Filter controls you can essentially do a custom mix to isolate parts or remove vocals. There are 4 modes available to assist you. The filters took some trial and error to grasp, but a few minutes in and you can pick most any element you want from the song and isolate it to a great degree in order to highlight it or to remove it. 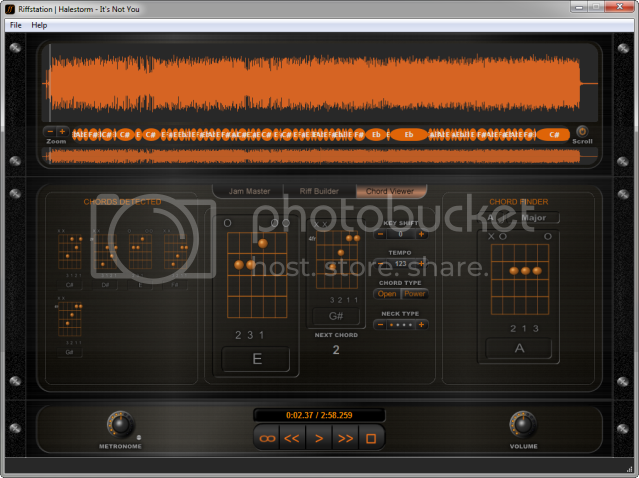 The second module is the “Riffbuilder” this is essentially a loop builder that breaks the song down into loopable sections for you to create your own sort of backing track. It’s also useful to create complex looping progressions in order to make your own backing tracks out of most any song. Very efficient and useful. The third module is the “Chord Viewer” and it’s a wonderful asset to beginning players especially. It breaks down the main detected chords into either ‘Open’ or ‘Power’ chords for you to quickly play along with the song. I found this somewhat useful to understand the basic structure of songs, but it doesn’t detect minor, 7th’s, etc..